I know I posted already but I really wanted to give this it’s own post. Whew! I cannot believe I finished the challenge! What a crazy ride it has been. I’ve done some make ups, struggled to post on time, and posted way too much. But all and all… I am proud of myself. I told myself that by signing up for this I was gonna complete it. I never complete anything! When I did my first post for the challenge, I mentioned that many posts would be crazy and some would have fashion. I totally hit the nail on the head for that. I had one post where I posted a funny parody which had nothing to do with SL. Another, I covered the Under the Sea Expo. Another time I talked about breedables. No matter what I posted… it was fun. I am gonna be so sad now that the challenge is over. I’ve had so much fun! But don’t fret! 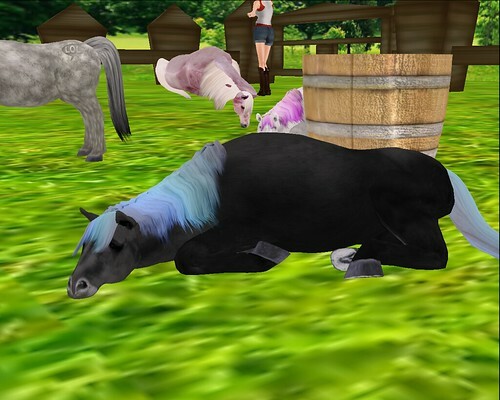 I still have much of the Twisted Color Challenge to do and also… I want to give updates on my BioBreeds. So please… keep interested and stay tuned! On a final thought, it just felt right to post a final picture for the challenge in the place where I took my first picture. Enjoy! If you notice I NEVER wear short hair. I cannot stand having long hair (weight of it) in RL but still think it is pretty. Thankfully in SL, long hair doesn’t bother your avatar. Anyway, I went out of my comfort zone and picked this adorable short hair from Exile. Glory to be exact. I stayed in my favorite dark browns too. Now for my dress. This cutie is from e! and it is the Lilly dress in emerald. I just love how it faded into the second color in the picture we had to work with. Shoes from Ingenue… Lydia Slingbacks in Tang. Maxi Gossamer finished the look with a Raisa Drop Necklace that I wore in purple. Closer and closer to the end of the challenge! What do I have for you today? Zaara release! Please welcome the bikini Naisha from Zaara! 30 Posts 30 Days – Day 27 – 100th Blog Post! Hip hip hooray! Why yes… this is my 100th post! I am so excited! I have come so far from this just being a hobby that I barely post on. In honor of my 100th, I made sure to dress in my favorite color and style. Purple mixing classy and rocker. Seriously… I have been thinking about this post all day and getting more and more excited! 100 have been great. May I have 100 more and counting! Some fun stuff happened today! First off… Coldlogic has a new release. Secondly, Firestorm updated its viewer. They are marketing that this update fixes many of the problems the previous update had. I for one had a devil of a time loading in and staying visible. I kept going invisible. But anyway, I just installed it like a minute ago and it seems to be much better. Stay tuned… I’ll letcha know how it goes. Tomorrow is a very big day. Tomorrow I will be posting my 100th post! I am so excited and thrilled that it is going to be during this monthly challenge. What a better time to celebrate 100 posts then doing it during a monthly challenge celebrating blogging! For you fashionistas out there who came for the coldlogic news… here she is. One of the looks. See ya for the 100th! Yeah I am semi doing strawberrysingh.com’s challenge and kinda not. I mean, I don’t wanna share my digits but I do wanna show my shape. I am very proud of it! Being 5 years in the making, I think I have earned that privacy! 😛 However, I will share how tall I am. 6’8″. So… how do you feel about your shape? Do you try and keep your avatar’s body proportionate and similar to the “average” proportions pictured above? (on her site) I mean I do my best but I try. What do you dislike the most about the SL avatar mesh? Probably that you need invisible alphas most of the time to wear it. Does it bother you when you see other avatars that are not proportionate at all? Sadly yes. I mean you can get shapes in world, friends are always willing to help, and there are so many people talking about shape. Totally no excuse. Even though this is a virtual world and people can be anything they want to be, do you feel when they are in human form, they should try to keep their proportions close to average? Nah. If everyone went average it would be boring. So there are my answers! Check out strawberrysingh.com and try her meme on for yourself! Wow… we are coming into the home stretch with the 30 Posts 30 Days Challenge! Check out what I did today. Yeah… I never thought I’d do it but I have bitten the bullet and dove headfirst into SL animal breeding. There are so many different breeding programs out and I chose BioBreeds. In my opinion, they look the nicest. Once again… in my opinion. That doesn’t mean someone else might like other breedables. But for me… I like BioBreed’s aesthetic. Simply put… there are a crazy amount of traits that you can breed for. 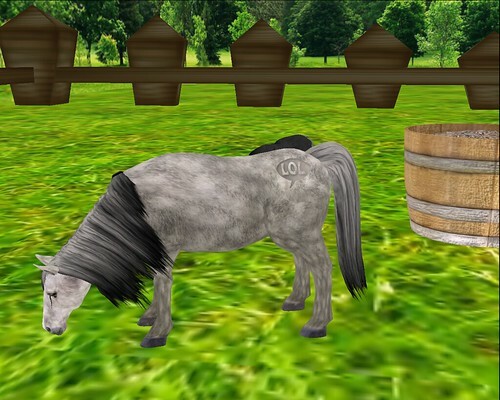 You can even breed regular ponies with exotic ponies. I already know once my first breeding experiment happens I wanna do that.